Warp and weft, words for the crossing threads of a weaver’s loom. Warp, running from sky to soil…weft, the length of the distant horizon. I’ve been thinking lately of the One who weaves our lives together, and how He takes those threads and works them into something new, something good. Sometimes, He chooses threads that I question. Sometimes, those threads don’t look so good close up. Sometimes the weaver’s hands tie knots and pull hard and I don’t know what He’s doing, can’t understand the purpose for this dark thread, this knotted path, this cord of suffering. I want to pull that thread from the fabric of my life, snip through the knots, cast it aside. I don’t see how this thread can be anything but ugly, I don’t see how it can add to the pattern, how it can do anything but stand out garishly against the soft colors of the rest of the tapestry. Like any great artist, God does not choose the materials He uses thoughtlessly. No, these colors, this texture, they are chosen with great care and with the outcome of the whole tapestry in mind. 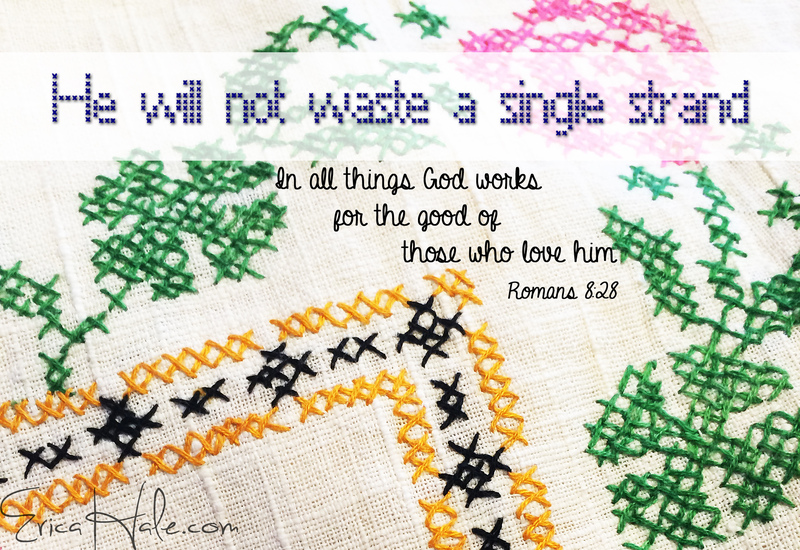 He does not waste a single thread, and uses nothing without a purpose in mind (click to tweet). The dark thread, the twisted cord, the frayed strand…these are woven tenderly and with forethought. They give the tapestry its depth, they give dimension to that which would be otherwise flat, lacking. When you step back, you see that the dark strands outline the highlights to bring out the beauty of the work, the perfect breathtaking genius and artistry that only could come from the hand of a Master. Friend, in the hard times know…the Master is weaving something beautiful, He will not waste a single strand. Erica, loved this post. It reminded me of a poem I heard Chuck Swindoll quote years ago on his radio program. May we learn to hang onto Him for beauty comes! Oh my! This is wonderful, and fits so well…when I have a moment, I will add it to the post! Thanks for sharing!! !